D-Log: Like it was yesterday! This December 1st is the 7th anniversary of our Fatiha, the legal marriage ceremony. In the picture are Hana's uncle Faraj Naas, who has passed away since, my brother Mohamed, the lamb-with-scarf, and Hana's brother Ayman. It was Tuesday, Dec. 1st, 1998 in the Naas house in Benghazi. Some representatives of my family had driven from Tripoli and Misrata. I was not there, but I guess I didn't have to be, and actually the groom is usually not present at this ceremony, even if he is in town. I am not sure where the pink scarf tradition started or why exactly, but... I guess that the scarf is an attention getter; after all, you don't often see a lamb sporting a pink scarf. Yeah, it's usually blue, right? I remember once seeing a lamb wrapped in a Haseer (a matt made of soft wicker-like stuff called Dees that grows around the spring of Tawargha) only its head showing with the pink scarf around it, all on top of a car leading a motorcade. First the car horns get your attention, then you just follow the pink scarf to know who's getting married in the neighborhood. 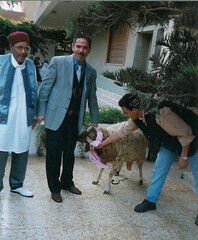 The funny little detail about the lamb in the above picture is, I later found out, my family actually did not get the scarf in Tripoli, where it is widely sold for this purpose. Also, you can't use just any old scarf. It is special: square, pink and larger than the ones meant for humans. Now imagine my relatives roaming all over Benghazi looking for this thing, where most people thought they had to be drunk or playing some sort of Misrati joke. Sure enough, they found one, a pink one to be sure, and the rest is history. Yes, you can say, it was all meant to be. Lots of things had to fall right in place, I remember. Hanu's dad told me, she was not gonna leave for the wedding in Tunisia until I assured them that her visa was ready! The Fatiha was on the 1st, I got confirmation from the embassy in Tunis on the 7th, flew out the next day, and the wedding party was on the 10th, a Thursday in keeping with tradition! That's the subject of another post, maybe in 9 days or so. Of course a lot of arrangements had been made in advance (remotely by guess who) including all the party reservations, hotels, music bands, etc. There were only minor glitches, really, everything went very well because it was meant to be. Lots of beautiful memories of those few days, and lots more since. Thanks, Hanu, and happy seventh. Thank you, redENCLAVE, and best wishes for the new year.